Benchmark your employee experience and earn accolades as a Best Workplace when it stands out. Since 1998, we’ve been the data scientists behind the Fortune 100 Best Companies to Work For® list. Using our rigorous methodology, we gather and evaluate employee feedback and recognize companies who have built high-trust, high-performance cultures. Our research is backed by data compiled from over 100 million employee surveys around the globe. 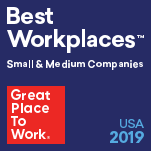 Every year, we conduct the world's largest study of workplace excellence and hold the gold standard benchmarks for your country, industry, location and more. Certified Companies substantially outperform the market overall. From start-ups to the world’s largest multinational companies, we acknowledge the best in workplace culture. We recognize companies of all sizes, in all industries, and around the world. See our FAQs below for details on how to participate. Great Place to Work offers the only program that can recognize your workplace in more than 60 countries. Take one survey, earn accolades everywhere. We partner with leading media publishers around the world to help your brand gain the best international exposure. Certain lists may require more employees (50+). Please contact us for specifics if you’re interested in a particular list. We use our For All Model and Methodology to evaluate our pool of Great Place to Work-Certified companies. Top-performing companies are recognized as Best Workplaces.